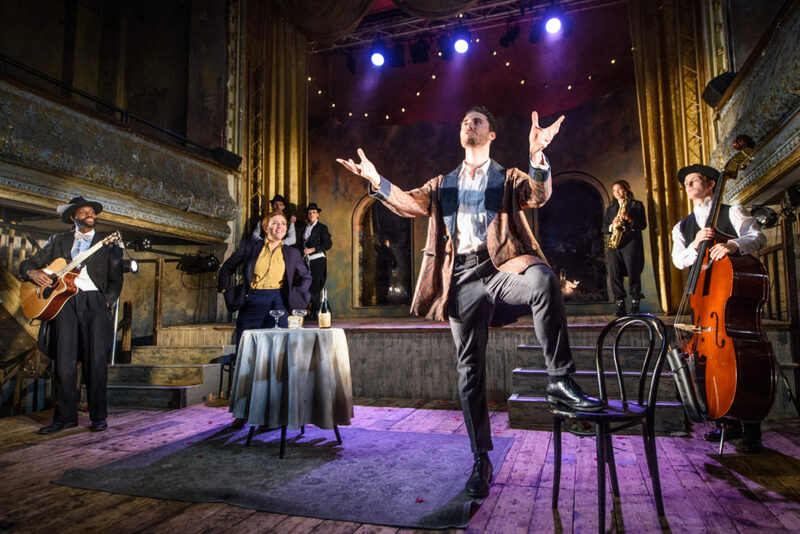 Wilton’s Music Hall is the perfect home for this fun and frivolous production of Twelfth Night, transferring after a popular run at the Watermill Theatre. The production oozes old-fashioned charm, and, with its talented troupe of actor-musicians performing a play so preoccupied with the power of music, is an energetic joy to behold. Sir Toby Belch is our MC in ‘The Elephant Jazz Club’, and wittily guides us through some lovely swing numbers to kick off the show. Each cast member gets to show off some of their musical and dancing talents early on, and the range of instruments on show, and the number of instruments played by each member of the ensemble is incredible. For fans of swing covers of recent hits, this is the show for you. Orsino (Jamie Satterthwaite) charges recently shipwrecked twin-in-disguise Viola (Rebecca Lee) to woo the mourning Olivia on his behalf, little knowing that Viola actually loves him, and, as the show goes on, that Olivia is more interested in the servant than the master. This comedy is less about plot and more about antics, with Belch, Aguecheek and Feste providing enough mischief conning Malvolio (played with relish by Peter Dukes) to keep this audience roaring with laughter. The songs, interwoven throughout, are gorgeous. Suits, hats and cigarettes are on full display to build the image of a twenties jazz club, and, though not providing a clear context for the story, nor adding anything other than a pretty aesthetic, the era seems to invite audiences to kick off their shoes and have some fun. On the whole, the ensemble work hard and give energetic and exaggerated performances. Mike Slader makes for a comically over-the-top Aguecheek, reminiscent of a greasy Crispin Glover, and Dukes’ Malvolio is stoic and uptight, making his downfall (in all its drag glory) even greater to see. It’s middle-of-the-road Shakespeare on display here though, with jokes found in physicality more than the text, and most players’ delivery feels a little too theatrical and forced at times. A touch more variety in delivery, or belief in what is being said, may help the meaning to shine through clearer. Lusciously lit in this beautiful space makes this production a hit though, and the audience were whooping and cheering raucously as the ensemble took their bows. Cracking comedy and tunes you can’t help tap your feet to are the order of the day, and this production delivers on all fronts.